Why Choose Corley as your plumber in Spartanburg, SC? ?‍? Up front, flat-rate pricing with no surprises! No matter your plumbing needs, Corley is here for you. Whether you have a pipe burst in the middle of the night, are looking to install a new sink, want to upgrade your bathroom, or have questions about your sewer, our professional plumbers are ready to come help make your home function the way you want it to! We are your comprehensive plumbers in Spartanburg, SC. That means that there’s no job too big or too small for us, and no problem we can’t solve. In fact, our plumbers have designed complex plumbing systems to overcome all sorts of issues. This means that they can handle your questions, no matter what. Plumbing Service and Repair. Whether you have a leaky faucet or need a new water heater installed, Corley has the best plumbers in Spartanburg, SC. We are equipped to handle all plumbing needs and with state-of-the-art equipment, flat-rate pricing and punctual service, we believe you can count on Corley plumbers to provide the best service available. Fixing clogged drains. Whether it’s in your toilet, your garbage disposal, or your sewer, we’ll get things flowing for you quickly. Sewer service. Speaking of the sewer, we’ll figure out why yours is causing you problems and what needs to be done about it so you can get things back to normal. Kitchen and bathroom remodels. Need a new look to your kitchen or bath? We’ll help you achieve the look you want with quality work that won’t quit. Fixture installations. Do you want a new sink or faucet? We’ll get it installed and working quickly. Water heater problems. Is your water not hot? Or maybe it’s too hot? We’ll help get your hot water just right. No matter your plumbing needs, our experts will get there fast, figure out what needs to be done, and work efficiently for you. We even have plumbers available 24/7, in case you have a plumbing emergency. Electrical Service and Repair in Spartanburg: Corley Electricians have been serving the Upstate for years with reliable, safe and punctual electrical services. Whether you need an emergency fix or would like to upgrade your home, contact Corley and our expert electricians will help you get your project done cleanly, on-time and with the best equipment available. Heating & Air Service and Repair in Spartanburg: Whether you need a simply furnace tune up or want to install a new air conditioning system, Corley guarantees that we can provide the best available HVAC services on the market today. We offer full service heating and air conditioning services, so you know that you’ll be set with just one phone call. Drain Service and Repair in Spartanburg: In addition to drain cleaning and traditional drain clog removal, Corley offers expert services like sewer line jetting and trenchless drain repair and replacement. Whether your drains need a simple fix, or a more in depth solution, contact your trusted plumber in Spartanburg. and we will be there to offer you superior, expert drain services on time and on budget. Started in 1986 by Chris Corley, our plumbing, air & electric company focuses on service and repair for both residential and commercial clients in Spartanburg, SC. 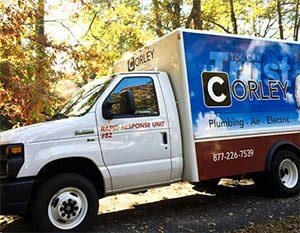 Corley offers professional plumbing, heating & cooling, electric, and drain services to the following Spartanburg, SC neighborhoods: Southern Shops, Valley Falls, Fairforest, Arcadia, Hampton Heights, Saxon, and Reidville.